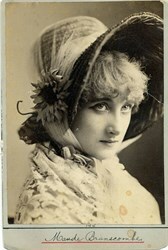 A portrait of the British actress Maud Branscombe (fl. 1870s – 1890s). ‘Who is Maud Branscombe? Her portrait is in every photographic shop-window. Sometimes she is a nun, her eyes raised toward heaven in fervent ecstasy; in another place she appears as an odalisque, with her yashmak drawn aside and her beautiful brow glittering with rows of sequins; elsewhere we see her dressed as a fine lady of the nineteenth century, and yet again as Ophelia or the Magdalen. Not a lounger on the Paris boulevards has passed unheedingly before that wondrously lovely face, and yet no one knows who she is, whence she came, nor whither she goeth, and if anybody in the United States can give information on these points, especially the third, a great boon will be conferred upon Paris chroniclers, who are terribly exercised as to her personality. Some say that she never existed in flesh and blood, but is merely an abstract idea of beauty created by some imaginative painter; others that she is simply a model who hires out her faultless features for a percentage on the sale of her photographs.’ According to the rest of the article, her real name was Sarah Ann Stokes and her father was an English clergyman. The tale includes a jilted lover, a baby, the boards of San Francisco, a short marriage with much broken crockery, and a child deposited with its maternal grandmother. Photographed by Mora of 707, Broadway, New York.